Now we are going to set-up the left leg in the same way that we set-up the right one. We are going to mirror our right leg’s set-up to the left side. Well that was interesting wasn’t it? Maybe it was even a little bit of fun seeing a tiny bit of life start to enter our character. We’ve got one more leg to do though before we move on. Now that we’ve completed the right leg there is a shortcut available to us now that will allow us to rig that left leg in seconds. This shortcut involves the use of a plug-in called MirrorBone by Steffen Gross. MirrorBone is a plug-in that will take one side of your installed rig and then copy and mirror your set up on the other side of the model. It will even mirror your CP assignments. I noticed that MirrorBone was already installed on my Windows version of A:M but I had to download it and install it for my Mac OS version of A:M.
Be sure to make sure to read Steffen’s page to find out if his plug-in is compatable with your version of A:M.
For this section you will need the MirrorBone plug-in to follow along. After Right-Clicking on “(GEO) Right Thigh” follow the menu options as shown above. To get started with this process you will need to be in your Modeling window and in Bones Mode. We want a mirrored copy of the “(GEO) Right Thigh” branch on the left side. What we’ll do to make that happen is to Right-Click on the “(GEO) Right Thigh” (This can be done in the PWS or in the Model window). 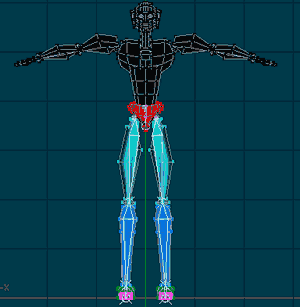 These settings in MirrorBone may produce good results for you with the Rig Training Robot (I have my modeling measurment units set to feet in A:M’s options in this example). With the settings I have there on the left, I will successfully mirror my leg set-up. The settings may need to change some depending on the model. The left side is all done in a matter of seconds! Voilà! The left side is now done. 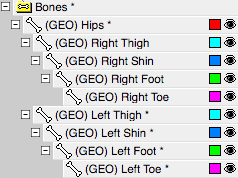 The new bones for the left side have automatically been properly renamed and the hierarchy is correct. When we check the hierarchy in the PWS we can see that it is correct. “(GEO) Left Thigh” properly named and is a child of “(GEO) Hips”. 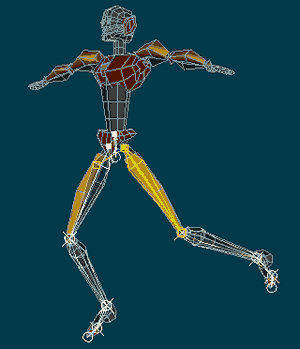 When we check in the Action window we will see that the left leg performs as expected. The left leg works as expected in an Action window. 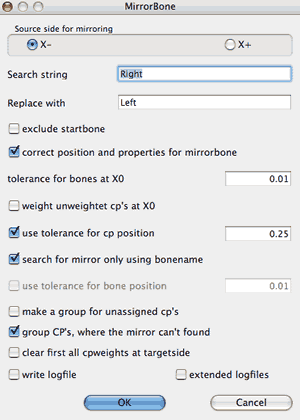 If you encounter a situation after using MirrorBone where bones on the newly mirrored side are missing, try the process again then try adjusting the values of the “use tolerance for cp position”. This has worked for me in those kinds of situations. 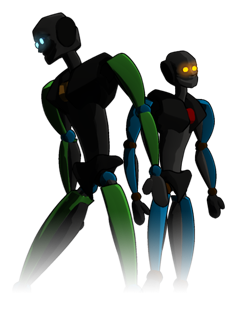 Here are the left leg’s new colors. We are now finished with the hips and legs. Before we move on I’m going to change the color of the bones in the left leg. I am going to do that because I will be able to easily see if I accidentally reassign CPs from one side to the other in the Modeling window (That can happen from time to time). 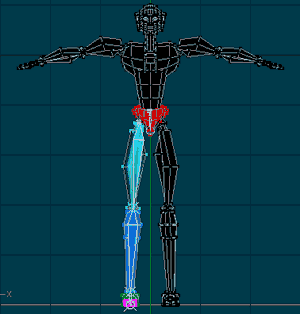 I am also going to collapse the leg branches in the PWS since we don’t need to refer to them right now and also to make things neater when we work on other parts of the rig in the PWS. I’ve collapsed the leg branches to make it a little neater in the PWS.